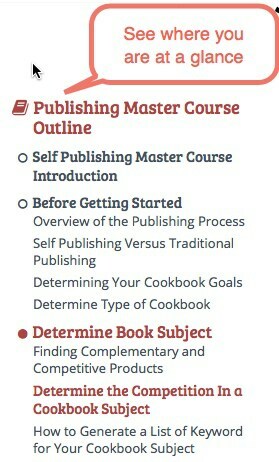 Welcome to the Self Publishing Master Course! We are so excited you've decided to take the first step towards publishing a cookbook of your own. Our course is laid out in a step by step manner that makes it easy for you to go through the entire book writing and self publishing process. We've also tried to break up the information into discrete enough chunks that you can quickly skip around and pick up the information you are currently interested in. On any screen larger than a phone the entire course outline is shown in the nav area, with your current section highlighted in red. At the bottom of every page we show the current section you are in, as well as the previous and next sections so you can easily move to the next article of interest. Go ahead and begin your self publishing journey by learning what you need to know before you start or jump directly to an article that looks interesting to you! We recommend taking some time and at least reading through the publishing process overview and the different section intros for the publishing processes. This will give you a good idea of what to expect during the publishing process. It will also alert you to things that should be started early on in the process. This includes things like understanding the different book formats and types of printers, as well as many tasks to promote your cookbook such as newsletter building and networking that should be worked on as you go along for full effect. We link off this site to many products, programs, and other websites. For full transparency, we try to always mark any affiliate links with an asterisk, like I'm an affiliate link. This alerts you that it is an affiliate link and you can always go to the URL directly if you want to by-pass it. We never recommend anything we don't feel comfortable with, but we still thought it was best to let you know. If you have any questions, or would like to see an article on something specific, don't hesitate to ask them on the Self Publishing Community Forums, in the private Facebook group, or in the comments that exist at the end of every article.